“Fake news” has become a widespread accusation, but what does it actually mean? Is it something that’s been invented out of whole cloth, like H.G. Wells’ planetary invaders? Different definitions abound, but I submit that fake news, at its core, is reporting in which the journalist selectively chooses and ignores facts, and interprets or paraphrases those facts to reach an unwarranted conclusion that conveniently validates his own views. It goes to the heart of how many reporters see their job these days. Readers may have seen the recent “news” about a physical fracas on the floor of the Texas House of Representatives, which reported that Republican Rep. Matt Rinaldi confronted a Democrat and engaged in aggressive verbal back-and-forth. The report said the altercation came to a climax when Rinaldi said, “I’ll put a bullet in your head” to the “the Democrat he alleged was menacing,” in the words of the Dallas Morning News account. It was in response to this protest that Rinaldi, according to the original report, said to the protesters he was calling Immigration and Customs Enforcement—prompting a physical tussle between Rinaldi and Rep. Poncho Nevarez and then the “bullet in your head” threat. Media outlets around the country carried this report. But what actually happened here, and which part was “fake”? We now know that the demonstration, which was indeed loud and noisy, took place inside the Capitol building and spilled onto the floor of the Legislature, which is highly unusual and not allowed. Cellphone video, which appears to have been taken by multiple people and released in the aftermath of the fracas, shows the demonstrators pushing and shoving Rinaldi, who kept his arms to his chest or at his side. Neither is a personal acquaintance, but it wouldn’t have been very difficult to confirm Rinaldi’s version of the story. But what did the Dallas Morning News report? Initially, it noted that Rinaldi did tell it that Nevarez did say he would “come get” him, with just “come get” in quotation marks. It left out the much more provocative and threatening phrases, “You’ll have to leave sometime,” and “I know where your car is,” plus the fact that Nevarez approached him twice. Moreover, this sentence was buried in the body of the text. The allegation that Rinaldi said, “I’ll put a bullet in your head,” came from another Democratic representative, Justin Rodriguez, who admittedly “didn’t witness the initial altercation” and only later said he heard Rinaldi make the comment. This allegation was also disputed by a number of representatives who were present. It should be noted that “nearly” is not the same as “did,” and the word “fistfight” overshadows the qualifier “nearly” enough to obliterate it. Later, Rinaldi issued a statement noting that Nevarez had approached and threatened him, and that he had responded to Nevarez saying he would “shoot him in self-defense.” That’s not exactly what Rinaldi remembers saying, but he let his public statement stand. Several of Rinaldi’s staff members contacted the Dallas Morning News after the initial story was posted and asked it to change the headline, which they felt was incorrect and misleading. According to sources with knowledge of the situation, the reporter replied, “There’s no proof he didn’t say it,” adding that because Rodriguez claimed Rinaldi had said it, this was sufficient to justify the headline. The headline remains online today. In the hours and days that followed, dozens of media outlets picked up the “bullet in your head” quote. When the cellphone video came out, several publications did amend their stories to remove allegations that Rinaldi had assaulted Rodriguez or other representatives. 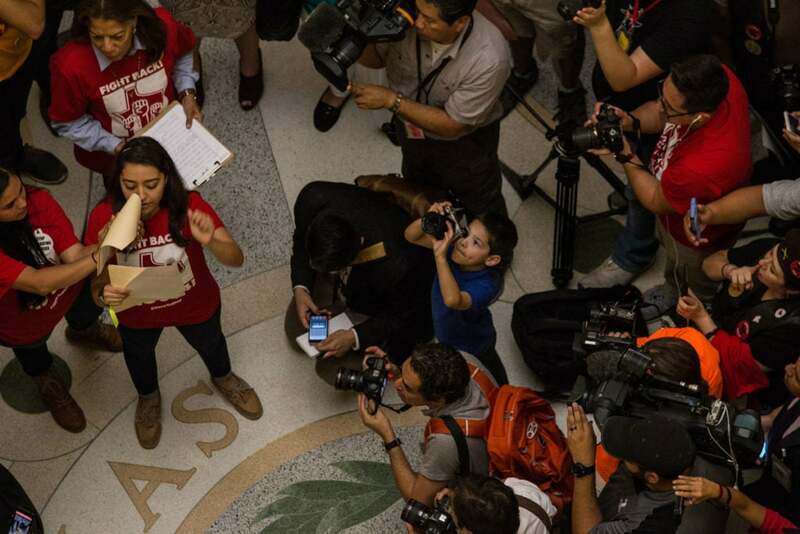 The conservative media, most notably Fox News’ Neil Cavuto, allotted six minutes to report the entire story, complete with video and images of the red-shirted demonstrators swarming the legislators on the floor. Cavuto carefully reviewed the timeline of who said what, and when. There was no mention of Nevarez’s repeated threats (“You have to leave sometime.”). In addition, the Dallas Morning News was still collecting expert quotes responding to its own description of what happened, rather than what really happened. But as noted above, there was no actual fighting. This story is tainted by a number of errors. First and foremost, the quotation, “I’ll put a bullet in your head,” which came from a clearly partisan source, should have been verified and immediately corrected upon learning that it didn’t come from the mouth of Rinaldi. Next, the original story downplayed or omitted a key part of the story—the initial threats from Nevarez. The comments from Rinaldi were provoked and came in response to aggression from Nevarez. While the Dallas Morning News did include a tweet from Rinaldi mentioning Nevarez’s behavior, there was no mention in the body of the piece about it. Additionally, the report painted a far more benign picture of the scene on the floor of the Legislature that was accurate. The participants were clearly organized and aiming to provoke a physical response. If that’s the standard for journalism today—saying something happened because there’s no proof it didn’t happen—we’ve truly entered the land of the news novella. What’s the lesson here for ordinary citizens? That statement proved especially salient in this case, where diving deeper into the evidence makes all the difference. The lesson for American news consumers is to be skeptical of what you read in all media and take the time to give the facts a second look. And there’s an additional lesson: Urge journalists to employ a little more self-examination to make sure they don’t cherry-pick the “facts,” quotes, and experts that simply ratify their predetermined conclusions. And when they do, we should call them on it.